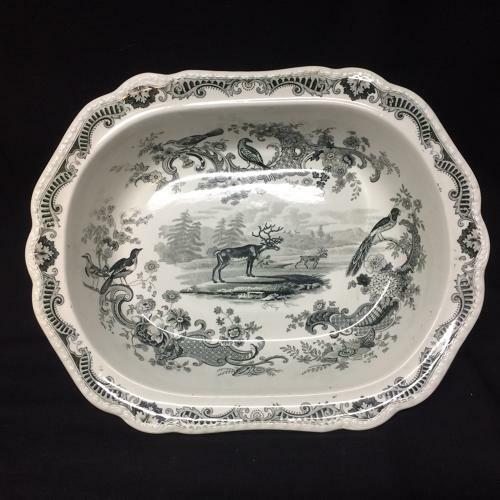 This is spectacular black Staffordshire transferware serving piece, c. 1820. It measures 12 1/2“ long and 10” across x 2 5/8 “ deep. It was impeccably potted and finely transfer printed in a rich and intense bittersweet black, with a pearlware glaze, gadrooned edge and scalloped rim. The central well depicts a Reindeer in the Canadian west. The piece has a bold border with 5 birds along with lavish flowers and a butterfly. An absolutely stunning composition. It was was made by Job Meigh and Sons, c. 1820, and is part of the elusive the Zoological Sketches series. The series features different wild animals and other exotic creatures on each form. It is in very good condition, with a chip to the underside of the rim.